‘War, war never changes…’ But it did, and particularly in 1914, it showed that advanced technology and ancient battle tactics can combine into a horrible cocktail of death and decay. That is the theme taken by the band 1914 from Ukraine. Their live shows are a spectacle, somewhere between re-enactment and death metal extravaganza. Their latest album, after a long time fighting to get their own sound heard, here is ‘The Blind Leading The Blind’. A work that tells of the folly that is war and the horrible situations it created, This definitely get the sound noticed, which is something I’m very happy about. The band takes their sound further though, and the fascination with World War I goes much, much further. You can re-read the interview I had with singer Dmytro Kumar about that here. 1914 delivers a firm death metal masterpiece with a sense of melancholy and despair woven into the very fabric of the songs. Repetitive riffing, stomping rhythms and firing on all cylinders, the band marches on and on with tunes like ‘Arrival. The Meuse-Argonne’ and ‘High Wood. 75 Acres of Hell’. Every song adhering to the theme, as cavalrymen swing their swords while galloping towards machine guns. Mighty tanks getting bogged down in the mud… It’s a blind dash for death. The only spark of hope is in the Exploited cover, ‘Beat the Bastards’, as a sense of rebellion emerges, but it soon submerges as the war continues. Obviously, there’s a link to be made here to the mighty Bolt Thrower. No wonder then, that on ‘Passchenhell’ we have Dave Ingram (also Benediction of course) singing along with the Ukranian battalion. But perhaps my favorite track on the album is ‘The Hundred Days Offensive’, which derives, like much of the album, a lot of force from the introducing sample. Here we hear a soldier talking to the man he just killed. “When you jumped in here you were my enemy, I was afraid. But you were just a man like me, and I killed you.” It’s here that we feel so deeply the disgust of the human tragedy, which we failed to learn any lessons from. Musically, the album is versatile and very catchy. 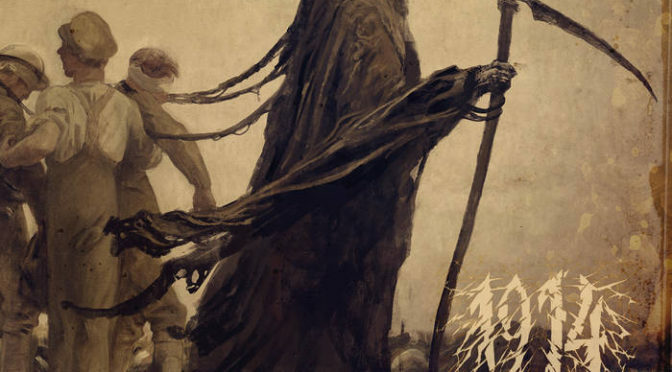 From fierce, pounding death metal, to harrowing melodic passages. 1914 has everything and more to offer. No wonder they just got signed to Napalm Records.